A packed-down trail gives you an easier, faster trip. 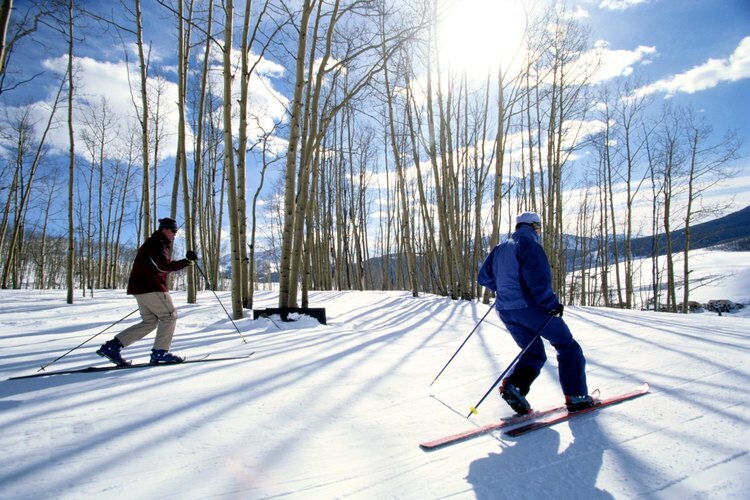 During the cold-weather months, many turn to outdoor sports, including cross-country skiing, to stay active. Unlike alpine or slalom skiing, cross-country skiing involves moving along mainly flat terrain on a groomed trail with cross-country skis. For the beginner, there are certain things to consider before venturing out on a trip. Understanding the basic techniques of cross-country skiing, safety issues and general know-how will make the experience a safe one. One of the most important tips before heading out on a cross-country excursion is to have the proper gear. All gear must be specifically designed for cross-country skiing, and it must fit properly. Cross-country skis generally come either waxed or unwaxed. Both work the same, except waxed skis require more maintenance and move more swiftly across the surface. Ski boots should fit comfortably, just as a regular boot would. The boot needs to match the binding system of the skis you purchase, for an appropriate and accurate fit. Poles are another important piece of gear. They provide stability when gliding and also help with turning or slowing down if traveling down a slope. Snow pants, snow jackets, hats and gloves are essential. Wearing a breathable layer underneath heavy outerwear will help keep body temperature regulated and prevent excessive sweating. Depending on where you are skiing, you should always have a map on hand in unfamiliar territory. For Nordic or marked trails, grab a map from the information center or base camp. This map may be a combination map of written directions and topographic highlights. For backcountry or unmarked trails (which is also referred to as ski touring), a topographic map is crucial. A topographic map shows landmarks and highlights both man-made and natural resources. It also shows changes in elevation and recognizes large obstacles, such as a water source or mountainous areas. Aside from having all of the proper outdoor gear, some equipment may be needed. A backpack is important for long trips. The backpack can hold safety gear, food, water, maps and medications. Even the best skiers can get off track or turned around; a small compass or navigational device will work with most maps and help the skier get back on track. A two-way radio or fully charged cell phone is essential. Be sure there is good coverage over the entire area where you will ski. You need a reliable means of communication with base camp, emergency services or other skiers within the group. Safety is important when cross-country skiing. Following the general rules and regulations of marked trails and state parks by staying on track will assure that you stay away from hidden dangers. Dangers may include hidden water sources or hot springs, drop-offs and cliffs. Traveling in a group is recommended. This will ensure a buddy system in the event there is an accident or emergency. Checking the weather ahead of time and right up to the hours before a ski trip is a great safety measure and will prevent traveling in poor weather conditions such as rain, ice, or snow. There are three basic techniques to remember when cross-country skiing. The first is "classic," the diagonal, or zig-zag, stride most cross-country skiers use. This technique works better on fresh powder or trails that may have a lot of loose powder. "Skating" is using the skis in a V-shaped formation to glide forward, shifting the weight from foot to foot.. This is used on a solid, packed surface or groomed trail and allows for more speed and consistency. "Telemark" is used when maneuvering down a slope. The heel is free rather than locked into the ski, such as that with alpine or downhill skiing. Ski poles are used for balance and support throughout all of the techniques.